Gala Graphics, the Rotherham-based graphic design and promotional print specialist, is on course to achieve a £1m turnover, just four years after it was established. After doubling its income in 2016 and 2017 and securing a number of major new contracts with businesses including Company Shop and FlexSeal, Gala Graphics is once again expecting to double its turnover this year. Gala Graphics has recently experienced growth within the motorsport sector – a key sector serviced by its sister company Gala Performance. As a result, the company is now looking to appoint three new members of staff within its sales team this year and extend its product range to meet increasing demand. Glen Robinson, managing director of Gala Graphics, said: "It has been a fantastic few years for the company. Our ongoing success is due to our commitment to employ highly skilled people and consistently invest in our equipment and services. We’re all excited to see what the future holds for Gala Graphics as we continue to break into new markets." Gala Graphics specialises in producing high quality, bespoke promotional products such as banners, flags, roller banners, cafe barriers and exhibition stands and walling solutions. The company is based in a custom-built facility in Manvers, which allows the team of experienced designers and print technicians to work side by side, serving customers from around the UK and the rest of Europe, on both domestic and commercial levels. 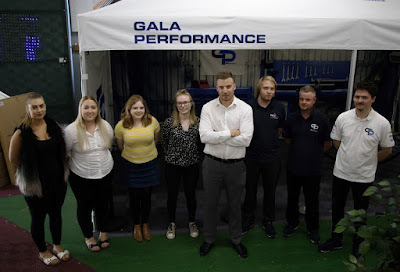 Gala Graphics is a division of Gala Tent, a company with over 17 years' experience in design, manufacture and supply of marquees and gazebos to the events industry.